The Pilot Plumix Medium Tip disposable fountain pen does not look like much. It looks like a cheap weirdly shaped pen. It is cheap, but its performance is not. When I saw the Pilot Plumix in Staples I was a bit wary. I had just had a bad experience with my first fountain pen (Kaweco Sport before I gave it a second chance) but I was still curious about fountain pens so I gave it a shot. The Pilot Plumix Medium tip has an italic flat nib which adds the flares and fancy stuff to my handwriting that I really enjoy. It lays down a smooth line without any scratchiness of the nib on paper. It does generally write quite well. 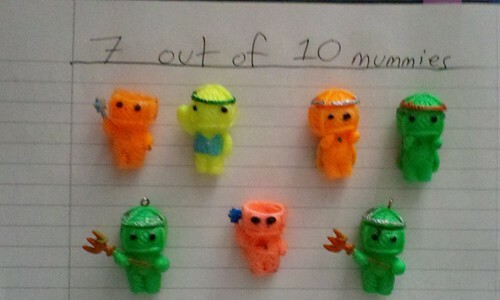 The only problem is occasional skipping, which in my writing sample happened uncharacteristically often. Other than the random skipping it writes great. In my Black N' Red notebook there was no bleed through and very limited show through. On thinner and or cheaper papers the bleed through and show through increase, so be prepared. The body of the Plumix is made of a lightweight plastic body, mine is translucent blue. The body has cool swirls in the design of the body which makes the pen feel really interesting in a good way. 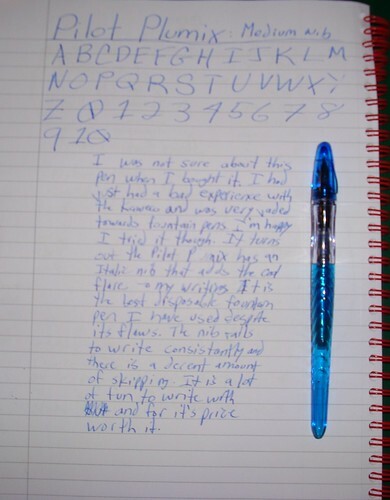 However, the lightweight plastic makes the pen feel really cheap. Although the pen body feels cheap the grip is great. The grip is contoured perfectly for my fingers and I could write with it for hours. The cap is very small, oddly small if you ask me. It isn't too much of a problem when the pen is capped, but with the cap posted on the end of the pen it seems very weird looking. Overall the body feels cheap and looks interesting, but has an awesome grip. 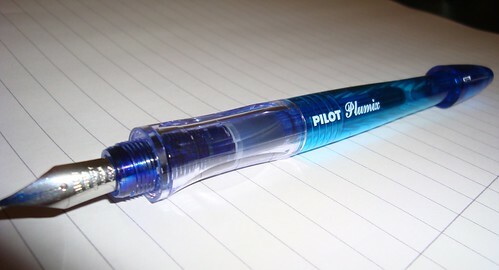 The Pilot Plumix Medium Tip is a great entry level fountain pen. It has the flourishes and flares of an italic tip with a very reasonable price. The body feels cheap, and the cap is weird. 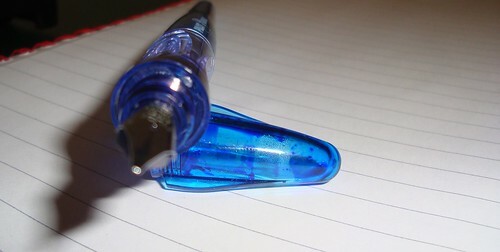 The ink is a very cool shade of blue but it skips and doesn't write consistently at times. For a disposable fountain pen I can't ask for very much more. i took the nib from this pen and put it in another pilot pen that i had (a pilot knight that i don't think they make anymore). works beautifully, and the flow is actually better, and it looks more professional.